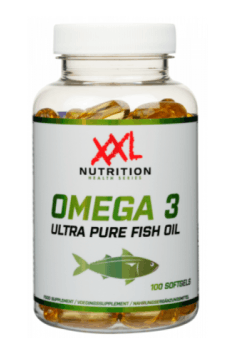 XXL Nutrition Omega-3 Ultra Pure is a dietary supplement containing the highest-quality omega-3 fatty acids obtained from fish oil free of impurities. The addition of vitamin E in combination with the essential unsaturated fatty acids (EFA) is a powerful support for the cardiovascular system, brain, and eyes. Nowadays, fish live in a polluted environment. This is caused as a result of toxic substances, including heavy metals, that built up in their organisms. The World Health Organization (WHO) recommends the consumption of fatty fish due to the high content of omega-3 fatty acids. However, considering the above situation, this could prove to be risky. Nevertheless, it is possible to provide EFAs in a different form. The convenient capsules provide an optimal dose of EPA and DHA. An additional advantage of the product is the lack of a characteristic fish smell. Docosahexaenoic acid (DHA) belongs to the group of essential unsaturated fatty acids. Its largest amount is in the brain. It is part of phospholipids that build cell membranes of neurons. It also participates in the production of neurotransmitters – it is a precursor form for dopamine and serotonin. Eicosapentaenoic acid (EPA) is a derivative and precursor to the afore-mentioned DHA. It has a particular anti-inflammatory potential – it inhibits phospholipase A2, whose activity results in the production of proinflammatory prostaglandins. In addition, EPA is involved in the improvement of cognitive functions, increasing memory capacity. Vitamin E is a compound belonging to antioxidants. It neutralizes free radicals, whose activity within the blood vessels causes many diseases. D-Alpha Tocopherol as an additive to the supplement effectively protects EPA and DHA against oxidation and chemical degradation. This ensures their long shelf life. The main function of the circulatory system is to supply oxygen and nutrients to all cells of the body. One of the most important factors that may contribute to its degeneration is the use of an improper diet. High intake of simple sugars and saturated fats, combined with a too low supply of omega-3 acids, result in pathological processes within the blood vessels. Free radicals are highly reactive chemical molecules. By coming into contact with various cellular structures and chemical compounds, free radicals cause their destruction or modification. Cell death or a change in the structure of proteins circulating in the blood results in the initiation of inflammation. It impairs the function of the blood vessels and the organs they supply blood to. Omega-3 and D-alpha Tocopherol are great antioxidants. They neutralize free radicals encountered on their pathway. This is an effective prevention of vascular diseases. It is worth noting that EPA and DHA may contribute to lowering blood pressure. In the pathway of metabolic transformations that occur in vascular endothelial cells, they are used to synthesize prostacyclin. This compound has a myorelaxant effect, i.e. it causes relaxation of the vascular smooth muscle. It also reduces platelet aggregation, which prevents thromboembolic events. Besides being an energy source, fats can also be a building material. Such a situation takes place in the nervous system. Neurons and glial cells use fatty acids to build myelin sheaths, which are responsible for the smooth transmission of nerve impulses. Their incorrect formation results in neurological disorders. Nerve cells communicate with each other using the substances known as neurotransmitters. Some of them, dopamine and serotonin, are synthesized from docosahexaenoic acid. These popularly called "happiness hormones" are primarily responsible for feeling pleasure. In addition, they coordinate the proper functioning of the musculoskeletal system, regulate the circadian rhythm, and also condition the maintenance of the normal body temperature. There is no doubt that vision is one of the most important senses, and any deterioration of its function results in a noticeable decrease in the comfort of life. This is why eyesight should be comprehensively protected. Researchers have proven that eye retina is the spot rich in significant amounts of omega-3 acids. Their supplementation protects pigment cells from degeneration. Studies carried out on people regularly taking EFAs have proven that they have been less likely to suffer from macular degeneration. In summary, XXL Nutrition Omega-3 Ultra Pure is a preparation that contains a high dose of omega-3 acids stabilized with vitamin E. The supplement is a powerful support for the cardiovascular system, with additional comprehensive support for the functioning of brain and eyesight. Take 2 softgels a day during a meal. Currently, most of the fish live in waters contaminated with heavy metals that accumulate in their tissues. Toxins are stored in adipose tissue of the fish, so the omega-3 fatty acids consumed with fish do not have the desired value. A much better idea is to supply omega-3 acids with the use of separate supplementation. The preparation is intended for people who want to prevent the progression of cardiovascular diseases or are struggling with its dysfunction. A diet rich in omega-3 acids also supports thought processes that slow down with age. They also provide protection for the eyesight. To increase the bioavailability of omega-3 acids, it is recommended to consume them with a meal containing fats. Store in a cool, shady place – it extends its shelf life. XXL NUTRITION are a high-quality dietary supplements and sports supplements, especially for bodybuilders. The wide range of the company products includes carbohydrate-protein supplements, amino acids, glutamine and creatine. There are also testosterone boosters, supplements supporting burning of fat, protein bars and caffeinated isotonic and energy drinks. Saturated water solution of magnesium chloride for topical application.